Prof. S Sivakumar and Dr. Lisa P. Lukose’s s work ; Broadcasting Reproduction Right in India: Copyright and Neighbouring Right Issues, is a ground breaking effort in legal literature on a subject of great importance in the contemporary world, but little written about in South Asia. Sports and performing arts take up substantial amount of broadcasting and TV time, attracting much commercial advertising, which in turn, generates an enormous amount of revenue for the media industry. Hence, the competition among these broadcasters to outdo the rivals and include these events in their programmes is very high. Consequently, allegations of the infringement of intellectual property rights, exercising monopoly rights, issues relating to public right to information and legal disputes often emerge, involving knotty constitutional, statutory and international treaty issues. The problems have got confounded due to numerous regulations, obsolete colonial era legislation still in force, extensive borrowings from the British Copyright Act of 1956, the monopoly rights enjoyed by the state owned broadcasters and India’s obligations under international treaties related to intellectual property rights. The authors have ventured out to make an exposition of this difficult and complex area of Indian law for the benefit of practitioners, academics and media personnel.. The authors commence their exposition with a brief introduction to the nature and scope of Intellectual Property. It would prove to be a very useful guide for those not familiar with this area in law. The reader gets a basic knowledge of the characteristic features of Intellectual Property, Copyrights, Patents, Trademarks, Industrial Designs, Geographical Indications, Integrated Circuits, Confidential/Undisclosed Information and Plant Varieties. Within the space of a few pages, the authors cover the main areas of intellectual property, with an account that is generally applicable to any jurisdiction in the world. In the proceeding chapters, an in-depth study has been made of Copyright law and Neighbouring rights in India. Emphasis has been placed on the salient features of the Copyright Amendment Act of 2012. Chapters V and VI are devoted to Broadcasting and Reproduction Rights, the main focus of this book. The authors are here engaged in an incisive discussion, based on constitutional provisions, statutory law, international treaty provisions and judicial decisions. It has been highlighted that the monopoly of media institutions, whether by state or private institutions, is detrimental to the rights of the citizens’ free speech, as guaranteed by the Constitution. The authors have cited the case of the state owned broadcaster, Doordharshan, using their clout with the government to enact a special piece of legislation compelling private channels, that had purchased rights to broadcast live cricket matches, to share live feeds with them. The book is written in plain and lucid language, making it comprehensible to layman and legal practitioner alike. It carries a Foreword by the Chief Justice of India, honourable Altamas Kabir, who, in no uncertain words, expresses his appreciation of this phenomenal research carried out by the authors, and presents the book as a ‘milestone’ among the publications of the Indian Law Institute. 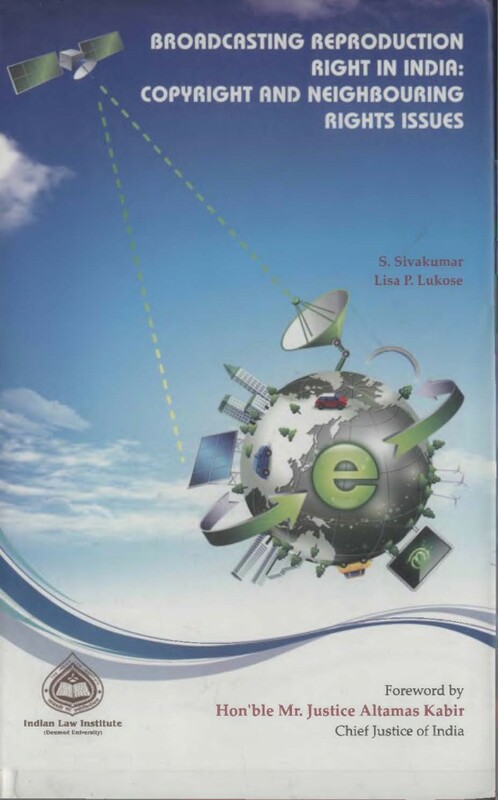 The book contains an appendix of relevant documents such as The Copyright Act 1957, Sports Boadcasting Signals (Mandatory Sharing with Prasar Bharati) Act 2007, The Cable Television Networks (Regulation) Act 1995, and International Treaties, which is an extremely useful source for any researcher who wishes to carry out further studies in this field. The book is priced at US $15, and is available at the Indian Law Institute, New Delhi, 110 001, India. This entry was posted in Research and tagged India. Bookmark the permalink.